Kertomalla paranee project is looking for areas of improvement and new solutions to improve the daily life of patients. Finland is one of the leading countries in cancer treatment. Yet, there is room for improvement. Now, HUCH Comprehensive Cancer Center, Novartis Finland, UPM, HealthSPA, Helsinki Business Hub and Sitra are together launching the Kertomalla paranee (‘improve by sharing’) project that aims to identify the real needs of patients and find new solutions. In the first stage of the project, patients, their close ones and healthcare professionals and researchers are asked to suggest areas of improvement concerning the daily life of cancer patients. In the second stage, the parties participating in the project assist in finding solutions by connecting real needs and start-up companies and SMEs developing the solutions. ”Even if the outcomes of cancer treatment are at the cutting edge and Finland is also one of the leading countries in technological innovations related to health, the solutions do not always meet the needs of the identified problems. Therefore, we decided to make things happen. 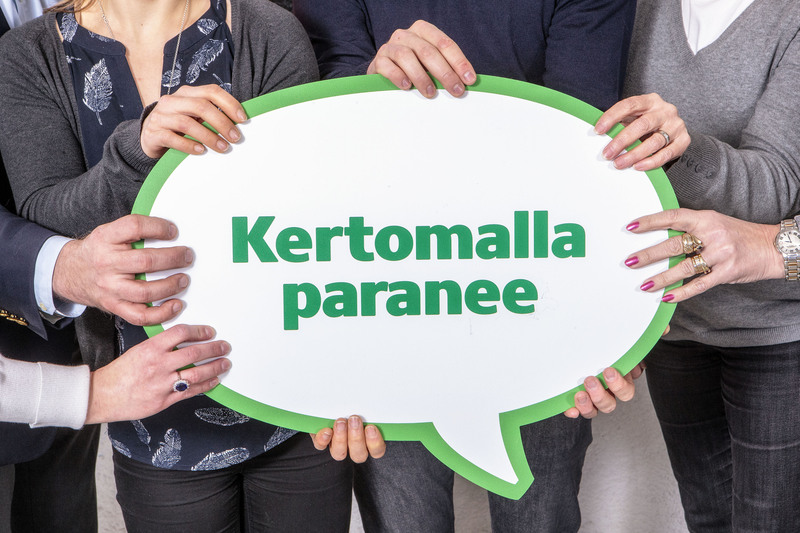 The Kertomalla paranee project is looking for new solutions through crowdsourcing to improve the daily life of patients and to develop their treatment. Our goal is to simply enable better treatment and daily life for cancer patients,” says Tuula Helander, Development Manager at HUCH Comprehensive Cancer Center. Finland has plenty of technological know-how, innovation and will to find new solutions. However, even good ideas may never become widely known or be refined enough to meet patients’ needs. The parties support the finding of new solutions in many ways; through their industry and financial expertise and wide network of contacts. Innovation can be more than, for example, a technical aid. ”An idea or solution can also be a small thing, for example a new practice that has a significant impact on the patient’s treatment experience, coping with daily life or receiving information. Many things can be affected immediately by changing practices or making the waiting areas more pleasant,” Tuula Helander points out. HUCH Comprehensive Cancer Center aims to pilot the new solutions. Adding to the significance of the project is also the fact that it enables collaboration between public healthcare and the private sector in Finland. HUCH Comprehensive Cancer Center is the largest cancer treatment center in Finland and it offers top-class treatment and research. Each year, the center treats 26 500 patients, 9 000 of whom are new patients. HUCH Cancer Center is the only Finnish member of the academic Nordic NECT research community (www.nordicnect.org), and the Organisation of European Cancer Institutes (OECI). Novartis is a global healthcare company that provides solutions to address the evolving needs of patients worldwide. In 2015, Novartis’ products reached over a billion patients. We make significant investments in research and development, EUR 8 billion in 2015. Our goal is also to find new areas of cooperation between Novartis and other parties to develop the treatment of patients. UPM leads the way in reforming bio and forest industries. We are building a sustainable future in six business areas: UPM Biorefining, UPM Energy, UPM Raflatac, UPM Paper Asia, UPM Paper Europe and North America and UPM Plywood. Our products are made of renewable raw materials and are recyclable. We serve a global base of customers. The group employs around 19,600 people and its annual sales are approximately EUR 10 billion. UPM shares are listed on NASDAQ OMX Helsinki. UPM Biochemicals offers and develops innovative, sustainable and competitive wood-based biochemicals for a variety of uses. We develop new bio-based materials for example for biomedical applications. Our high-quality products are derived from renewable wood originating from sustainably managed and certified forests. We want to accelerate the development of new solutions through collaboration. UPM – The Biofore Company. HealthSPA is a start-up community that develops health and well-being solutions and brings healthcare professionals, larger companies, start-ups and other players in the industry closer to one another. Our goal is to help Finnish healthcare companies succeed. We have helped over 250 start-ups to cooperate with investors, industry professionals and the media, for example. We are also the organiser of Upgraded Life Festival, the largest healthcare start-up event in northern Europe. Helsinki Business Hub plans to make Helsinki the best start-up accelerator in Europe. The health and well-being industry is one of our focus areas. We promote the development of new solutions for the healthcare sector in the Helsinki metropolitan area and in Finland by bringing together businesses and players in the public sector, accelerating and simplifying the piloting of solutions in authentic environments and by creating new business opportunities. Sitra is commissioned with the task of promoting Finland’s economic growth, stable and balanced development. Health, work and participation are the key factors for well-being. We create tools and incentives which help people to take part in the promotion of common good and take responsibility for their close ones. Our goal is to promote solutions to problems concerning health and well-being.